Noel Atkins was born in Launceston in 1925 and lived in the area of Invermay that was inundated by floods in1929. He was thus a quintessential ‘swampy’ and seemed destined to represent North Launceston after starring at football as a junior and being selected as first rover in the State Schoolboys Carnival team in 1939. However, due to labour shortages caused by the Second World War, his professional career first took him to King Island in 1944 and then to Hobart in 1945 and 1946 as he undertook his first placement and teacher training. Atkins’ football career blossomed and he was Hobart’s first rover in the club’s initial foray in the Tasmanian Football League. He was also selected as the League‘s first rover when it played against the two northern leagues in the intrastate series. Atkins proved an impressive young leader during a period of resurgence in football following the Second World War. After completing his teacher training he returned to his roots and took a position at Invermay Primary School. In the period 1947 to 1949 Atkins played a starring role in three NTFA premierships and two state premierships for North Launceston. A highlight of his time at North Launceston was his selection for the Tasmanian team at the 1947 National Carnival in Hobart. 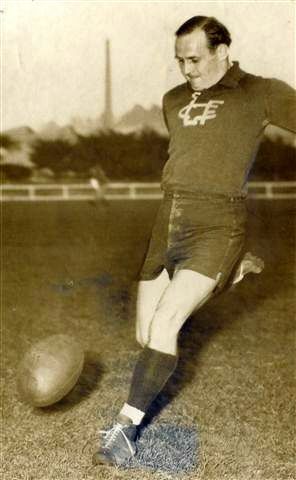 Along with North Launceston teammates Bert Chilcott and Ray Summers, Atkins formed part of the only ruck combination to have represented their club, league and state in the same season. After the 1947 Carnival Atkins resisted overtures from Carlton because of his commitment to his career in education. It was no surprise that at the young age of 24 he would be pursued as a coach, with first Launceston and then East Devonport benefiting from his skills and knowledge. After taking Launceston to the 1951 Jubilee premiership in the NTFA he had to be content with further runner-up titles in the NTFA and NWFU. A notable feature of his time at East Devonport was his role as coach of a young Darrel Baldock. During this period Atkins also became the first person to have represented all three major regional associations in the intra-state series. Following the conclusion of his career at the highest level in Tasmania, Atkins returned to King Island as school principal and continued to contribute to community football before spending many seasons as a coach and manager of schoolboy football in north-west Tasmania. Two of his best known pupils were John Greening and Stephen Beaumont, who have also joined him in the Tasmanian Football Hall of Fame. Noel Atkins has been recognised in the North Launceston, Launceston, King Island and Currie Teams of the Century and was an inaugural inductee in the Tasmanian Football Hall of Fame in 2005.